Need a cute bear for your new project?? here I have element pack for you, also include in the zip one set alpha. You can use it for CU/PU/S4H/S4O, it's up to you as much as you follow my TOU. Thank you so much for this post. I want to let you know that I posted a link to your blog in CBH Digital Scrapbooking Freebies, under the Page 2 post on Jul. 02, 2010. Thanks again. Thanks! It downloaded well. I signed up for A drive too. 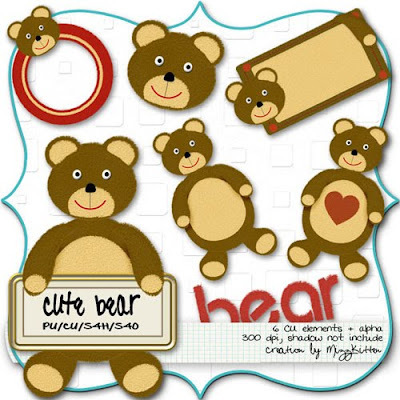 Thank you so much for sharing the freebie Cute Bear.